"Usain Bolt's Tracks & Records yaady approach to relatively simple restaurant food will have its crowd. But yet, for all that intense localism, I suspect wider ambitions here"
Ah,’Tracks’, the Ting Irie of the authentic west. Oh, stop wincing, this is my home turf. All the things that make me frown about Marketplace are also the things I love about it. It’s a place where people live out real lives, in fingertip touching distance of the action, but separate from it. But it also gives context to Usain Bolt’s Tracks & Records, set handsomely on the hem of the courtyard. Perhaps the last real time we spoke about UBT&R was when our fair lady Khlo-money kardashian popped in for a pre-club dinner. So yes it’s not exactly the talk-of-the-town brick and mortar we thought it would be, but with a sister location newly opened in Ocho Rios - let’s not switch on them yet, they’ve got big plans. The food remains in that safe zone of familiarity akin to the service - in which case is not a great thing. 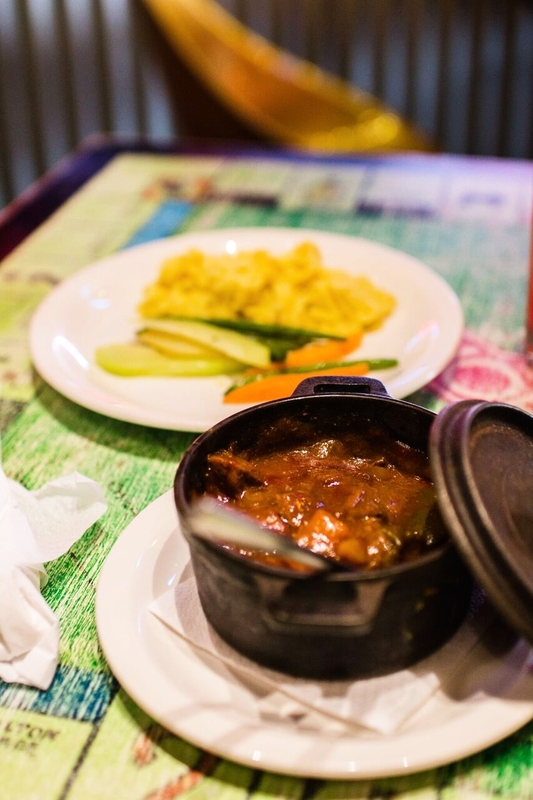 But loose courtesy aside, if you want good Jamaican food shaken and served, then you simply can’t go anywhere else. Jerk Platter: I've had this platter before and it was better then than now. In general its a good shot at a Faith's Pen pit-stop platter. Homestyle Oxtail: Simply divine! Maybe its my eternal oxtail bias or it's just that good. Creamy Alfredo Past + Chicken: What creamy aflredo pasta with chicken is expected to taste like I reckon. Tracks Signature Cheeseburger: Who can hate on a cheeseburger though? Usain Bolt's Tracks & Records yaady approach to relatively simple restaurant food will have its crowd. Since its arrival on the epicurean board in 2013, I've been eternally obssessed with their jerk chicken springrolls. It is for me on of those any day any time bites you just can't get enough of. The spice, the corn, the plaintain, the crisp... mhhm. But yet, for all that intense localism, I suspect wider ambitions here. Like Ting Irie, Tracks -again- feels roll-out ready. With a third franchise to be opened in Montego Bay soon, my eyes are peeled. If they can keep the standards up, any city would be happy to have one of these.